Our 1:1 pilot would involve five high schools, thirty-four teachers, fifteen hundred students, and approximately 1600 iPad-2s, cases, cords, and styluses. Of course, it would involve countless hours of planning and preparation. Typically a two to four year process, we put our proverbial foot to the floor and cranked out our pilot in nine months. With day one just a couple short weeks away, we finalized and mailed invitation letters to students and their parents informing them of their enrollment in at least one 1:1 pilot course. Recipients were also invited to an information meeting where authorization and insurance documents would be collected, and more specific 1:1 details would be discussed. (+) The information meetings were well attended and parental support was enthusiastic. Our presentation slide show was broadcast from an iPad though Apple TV in our school auditorium. (-) Attendance was only 25 - 30%, so hundreds of forms needed to be collected prior to our planned, day-one distribution. With less than two weeks to go, some 1600 iPads are shipped to our schools. The need to be unboxed, tagged, inventoried, and prepared for configuration. Creative storage is needed. (+) The delivery and packaging of the iPads, like the device itself, is top quality. (-) Our shipment of USB syncing blocks is delayed, and a replacement model proves to be ineffective. We end up syncing our 320 iPads one at a time. Luckily, each one took less than a minute to apply the base configuration. (+) Out of our 320 units, only two had issues right out of the box. One with a dead battery, and one with a bad wireless card. (-) Teachers are excited that we also purchased Apple TVs, but our classroom projectors do not have HDMI input. We had to order converter boxes to make iPad mirroring work. Still waiting on some parts. We sorted and grouped the ipads by course, and then matched a serial number to a student ID number. This took several hours of putting information into a spreadsheet. (+) The preparation proves to be worth the effort as the numbers were aligning perfectly, with several students overlapping into multiple pilot courses. 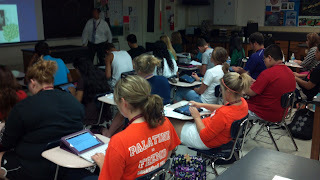 All iPads are present and accounted for. (-) A couple of last-minute course changes necessitated a few phone calls and one course overload approval. Student schedules should be locked into place whenever possible. Day one arrives - students are excited, teachers are excited, our tech support team is excited because we have been anticipating this day for months, if not years. District administrators and the press arrive to to observe the roll-out and record the moment. Me and a few members of my technology staff greet students, collect remaining forms, and distribute iPads with the respective peripherals. We walk through the initial set up. With the teacher, we emphasize the expectations for responsible use and care of the iPads, as well as, the primary goal of accelerating and enhancing learning in challenging, yet collaborative ways. Increased student engagement is the most obvious observable change. 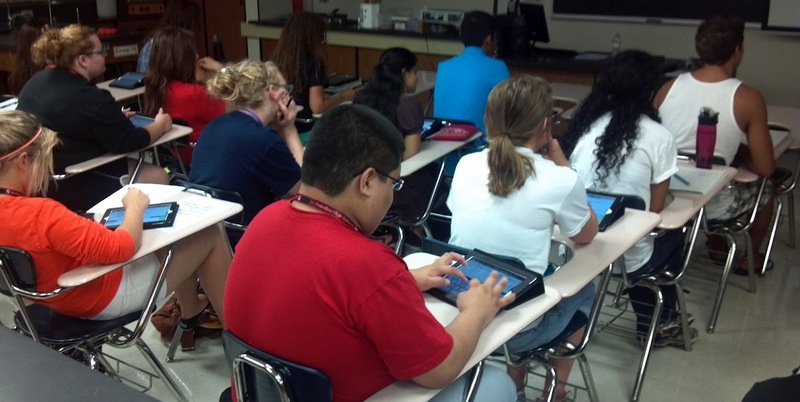 Device usage as school is nearly constant, both in and out of the classroom. Although there have been a few reports of distracted usage in non-pilot classrooms. Students are personalizing their iPad usage. Responsible care has been terrific. However, one theft at another school, from a PE locker room, was reported yesterday. I dropped off two iPads to the Apple Store for replacement or repair. Going to take a few days to get replacement units. Participating teachers report feeling like first year teachers. They are redefining their role in the classroom, and dramatically transforming teaching and learning in their courses. Exciting and daunting at the same time. Students enjoy helping one another with the technology. Students like knowing that their teachers are learning along with them. Non-pilot students and teachers are hoping, and planning for, program expansion. We are already in the planning stages for 1:1 expansion. This will depend on showing improvements with student success measures, budget considerations, and progress with teacher professional development and training. It has been an exhausting, but invigorating week at my school.